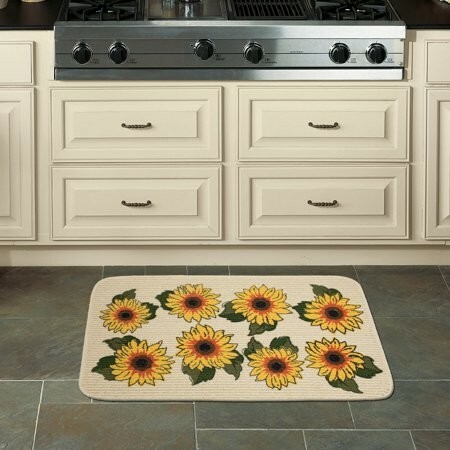 Mainstays Sunflower Kitchen Mat, 18" x 30"
Sweeten your home with summertime inspired style any season with Mainstays Sunny Sunflower floral print kitchen mat! 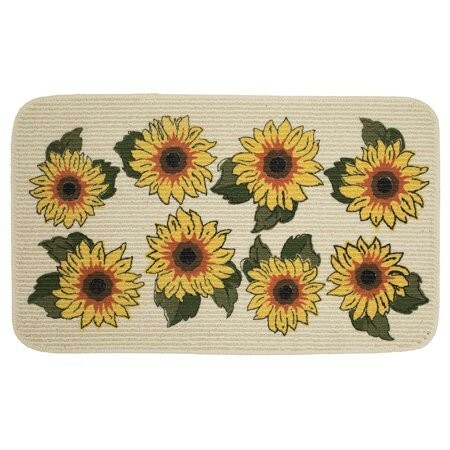 Golden sunshine yellow flowers with green leaves blossom across the neutral cream-colored canvas. Crafted with fade and moisture resistant olefin yarn, this durably designed kitchen mat is highly resistant to every day wear-and-tear, you can expect it to stay newer looking longer. 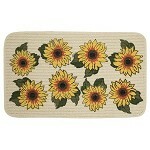 Soft and supportive underfoot, this rug also offers a superior stain resistance and vivid color clarity. Backed with the dependability of latex, this nonslip kitchen mat is designed to stay safely and securely in place. 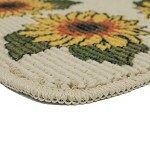 Spot clean with a solution of mild detergent and water for easy care!